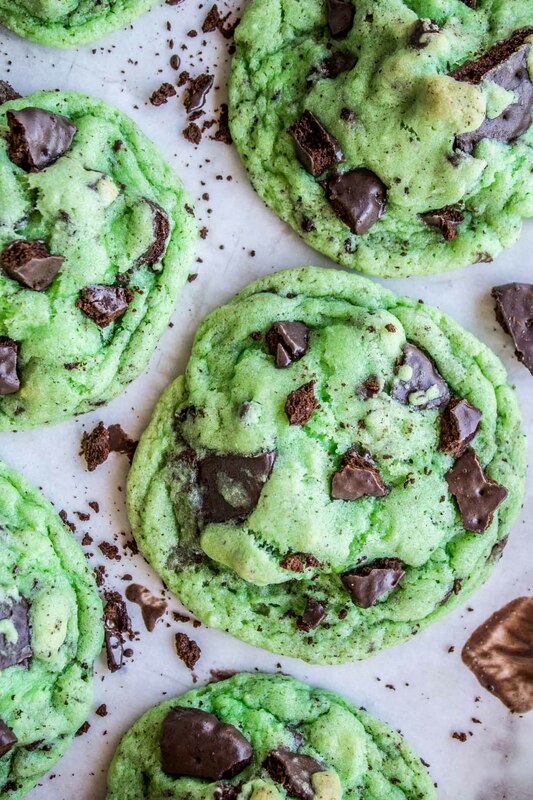 It’s like cookie inception: a mint cookie…in a mint cookie! 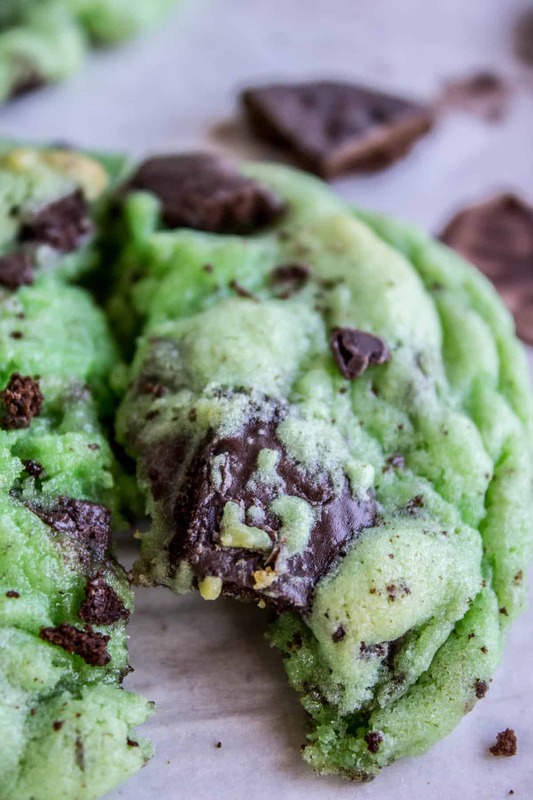 Two cookies in one has never been a bad idea, but this one is particularly fabulous because there are THIN MINTS involved. Come on, I know you’re obsessed. 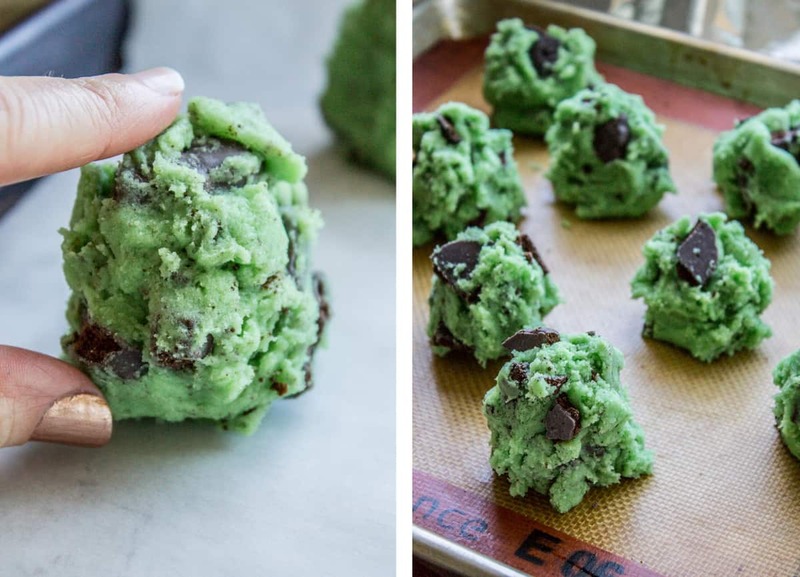 These are very similar to my Mint Chocolate Chip Cookies! They are both perfectly green for St. Patrick’s Day! I just got back from a blogging conference at the Googleplex (google HQ), where they taught us about how to blog and stuff. (I think. I was mostly Instagram-ing during sessions. Fail!! or win?? Instagram IS a part of blogging…) Just kidding, the conference was great and we even heard a few sessions from Google employees themselves who taught us what a search engine was. I had no idea! Okay, okay, sorry for all the sarcasm. It’s just that I feel like you learn more in the hallways chatting with other bloggers than you do in many of the sessions at these kind of events. (That’s got to be true across the board for conferences, right?) It is awesome swapping advice in person. And it was SO fun putting real live faces to all the online friends I’ve made over the years in this industry. 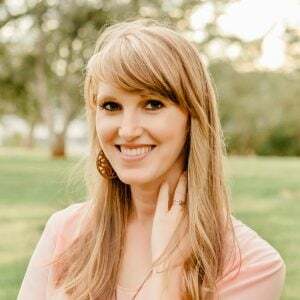 I rarely travel for the blog, (hello 3 kids!) so I was able to “meet” some friends that I have already known for many years. A little surreal! Did I miss the Girl Scout cookies train? Have you already scarfed all your Thin Mints? Or is there a box hidden in the back of the freezer just for one of ‘those days’? Because today you have a chance to shove a cookie inside of another cookie, and you really shouldn’t let this pass you by. 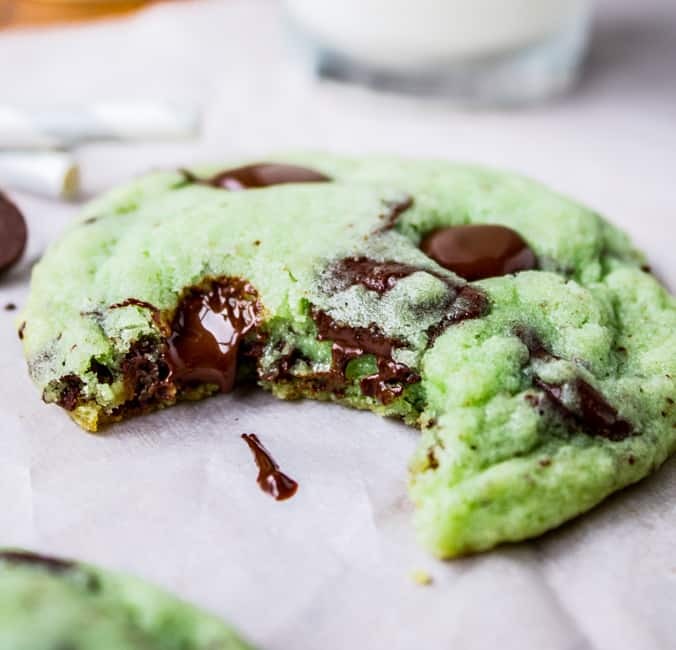 The base recipe is basically the same as these Mint Chocolate Chip Cookies, except I added a little less peppermint extract. There’s nothing worse than a toothpaste-flavored cookie, amiright? Too much mint goes south really fast. With a half teaspoon and the chopped up Thin Mints, it is just perfect! I love enormous cookies. These are 1/4 cup size. Feel free to make them smaller! Lower the bake time a couple minutes. Oh and sorry this photo is misleading, don’t put them that close together on the pan when baking! I was flash freezing them. The cookies are soft in the middle but have a little crunch on the outside edge. I like to add chocolate chips to the top of each cookie right after it comes out of the oven, to amp up the chocolate gooeyness factor even more. You can’t see them in the pictures because they are not there because I forgot to add them because I’m a dork. But you are not a dork and I’m sure you will remember to do it :) Happy Wednesday guys! Hope you’re having a great week! One year ago: 30 Minute Pea Soup (From a Bag of Frozen Peas) <this would be a good St. Patrick’s Day meal! It's like cookie inception: a cookie...in a cookie! 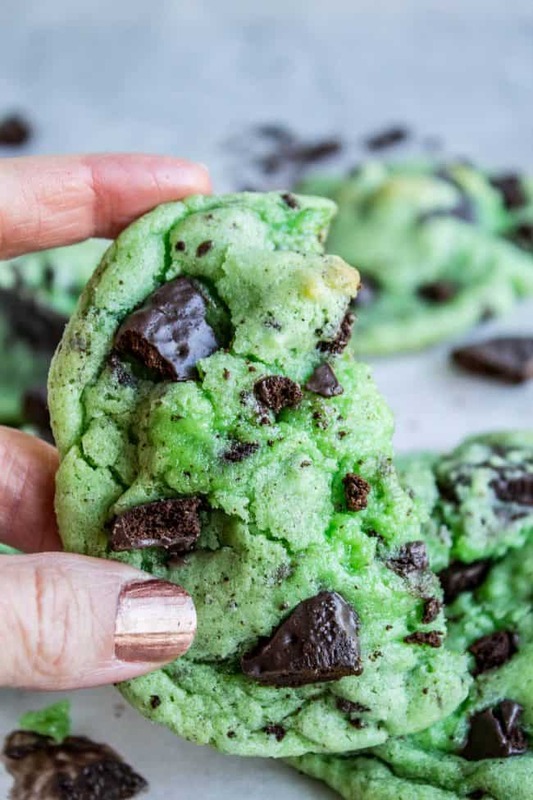 Two cookies in one has never been a bad idea, but this one is particularly fabulous because there are THIN MINTS involved. Come on, I know you're obsessed. They are perfectly green for St. Patrick's Day! Preheat the oven to 350 degrees F. Line one or more baking sheets with parchment paper or a silpat. Add the eggs + yolk, peppermint extract, and food coloring. In a separate bowl, combine flour, baking powder, baking soda, cream of tartar, and salt. Add to the wet ingredients and combine until the flour is not quite incorporated. Use a sharp knife to chop about 30 Thin Mints into quarters. 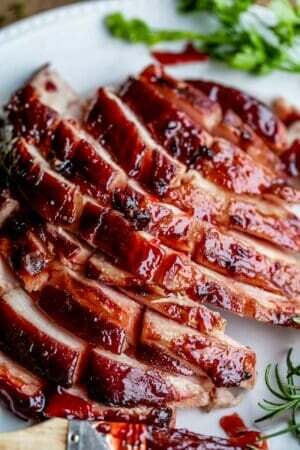 Chop a few extra and set aside. Gently stir the cookies into the dough. Don't go crazy, you want the cookie chunks to stay big. Cover the dough and refrigerate for about an hour. Use a 1/4 cup measuring cup to form balls of dough and shape them into a long oval shape (not a ball shape, think more egg shape). Press a couple more cookie chunks into each cookie if they are looking sparse. Place them on the cookie sheet (the tall way) lined with parchment paper or a silicone mat. These are very large cookies, I only did 8 cookies per pan. Bake at 350 for about 8-10 minutes, or until BARELY starting to brown on the edges. The centers should mostly be not-shiny when you take them out, but a little shine is okay. 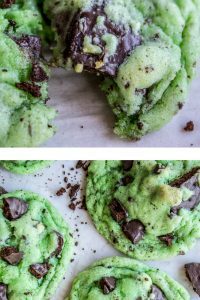 I adapted this recipe from these Mint Chocolate Chip Cookies. 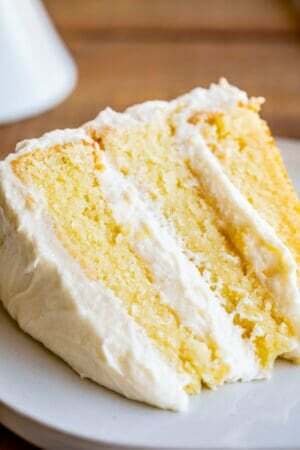 You might also like these recipes! 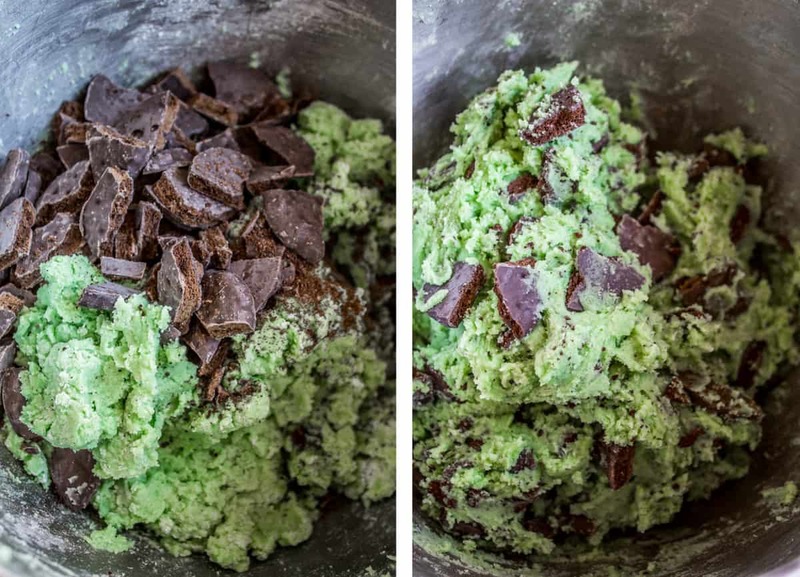 The original Mint Chocolate Chip Cookie recipe! This is a huge reader favorite! 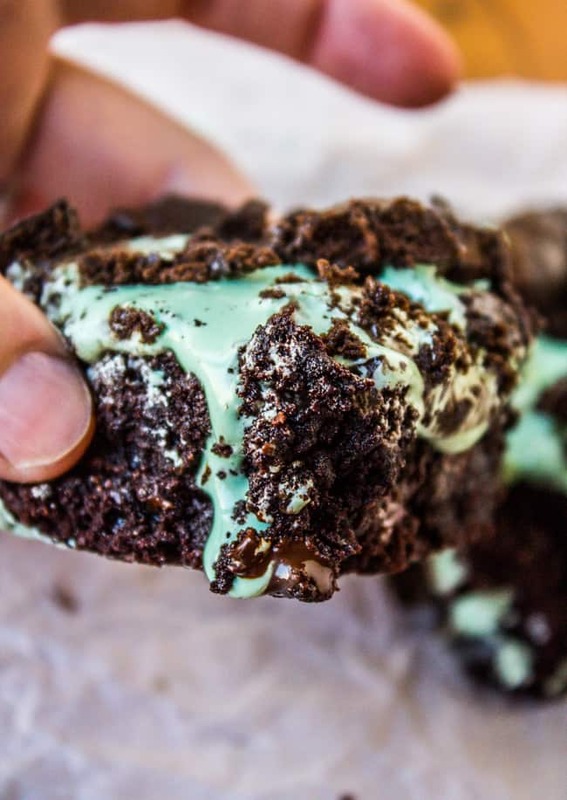 Thin Mint Marshmallow Brownies << this sounds over the top…it is. DO IT! 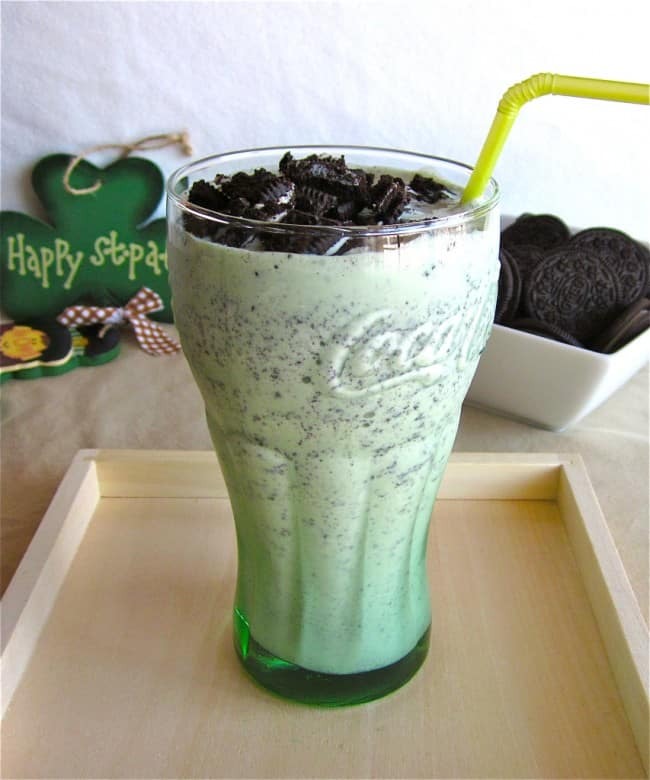 Here’s a throwback…Oreo Shamrock Shakes! These are so good! 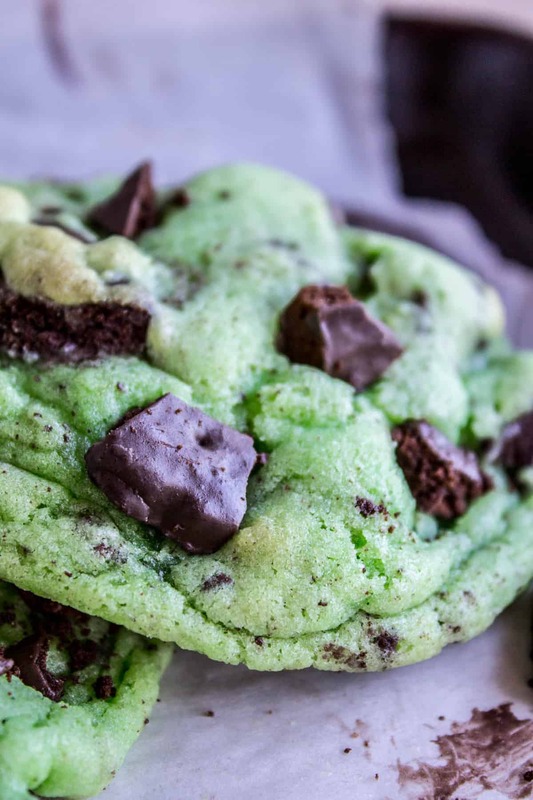 More mint chocolate goodness from other bloggers! I can now put the extra boxes of thin mints I have to good use! YES!! Best day ever! :) Hope you enjoy them! Hey Karen! Any idea if you can use After Eight Mints instead of Thin Mints? 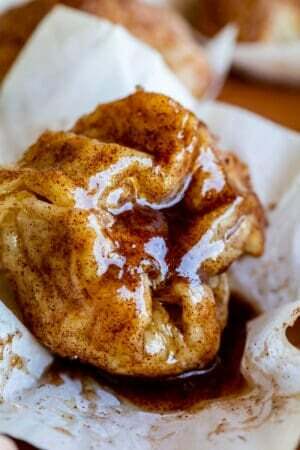 These look delicious and would love to make them! We don’t get them in the UK! Hmmm I’ve never had After Eights but I looked them up and they don’t look crunchy. 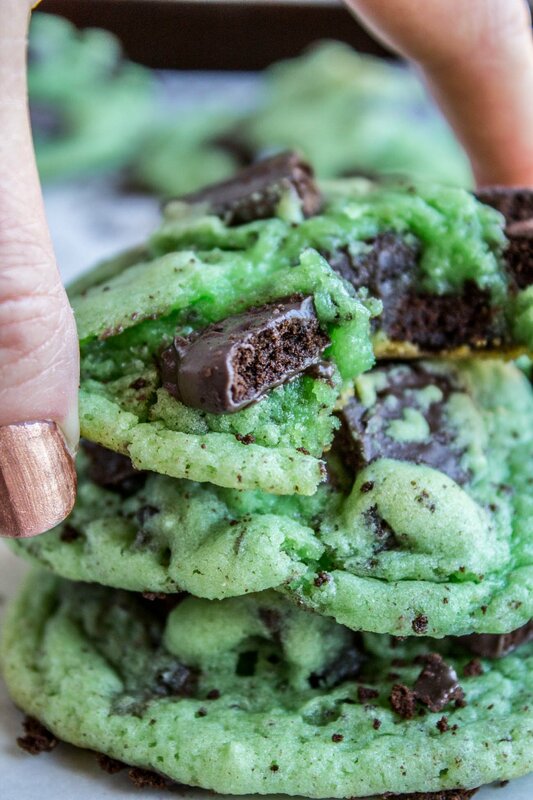 Is there a cookie layer in them, or is it mostly mint candy and chocolate? Don’t get me wrong, if you chopped it up and added it to these cookies I think it would be AMAZING. But it wouldn’t be crunchy. Can you find chocolate wafer cookies anywhere? I would add half chocolate wafer cookies and half After Eights. That would be so good!! Let me know how it goes!! Thanks Heather!! 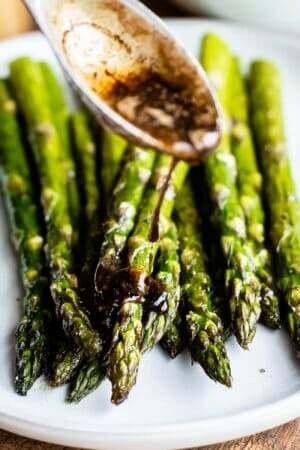 You can use grasshoppers too :) :) I know it’s cheating but they are actually really good!